Vibration energy harvesters behave very differently in real environments than when they are exposed to synthetic vibration conditions in the lab. To address this problem, we have collected long-term vibration data from a range of applications (including vehicles, machinery, and humans). These data sets are now available for free download from the Energy Harvesting Open Access Data Repository, which is managed by the Energy Harvesting Network. The Response Surface Model-based Design Explorer (Windows .exe), pictured right, is available for download. It allows you to adjust the design of the vibration energy harvesting system and see what effect it has on the number of transmissions a wireless sensor node can make. This video explains how it works. An Energy Harvesting Simulation Toolkit (.zip) package, which includes documentation, may also be downloaded. Energy Harvesting Systems: A Block Diagram (2010, July 16). Holistic Energy Harvesting [Online]. Available: http://www.holistic.ecs.soton.ac.uk/res/eh-system.php. Click here to get an overview of our demonstrator deployment, including a video from Dr Alex Weddell, University of Southampton. Click here to find out more about the demonstrator deployment, with a video of a conference presentation from Dr Geoff Merrett, University of Southampton. Click here for a video about our design explorer, which is based on a "Response Surface Model" technique. Video by Dr Tom Kazmierski and Dr Leran Wang (Phil), University of Southampton. Click here for a video about smart computation for EH systems, and variable power supply. Video by Newcastle University. Click here for a video about self-timed SRAM. Video by Newcastle University. The project is now at an end, and the consortium held a workshop at Imperial College London on 11 February 2013 to showcase the project's demonstrators and research findings. Slides and other material from the event can be found here. The EPSRC have funded a follow-on project by the University of Bristol and Newcastle University on power-conditioning and computational electronics that will be able to survive in power-deficient modes. Alex Yakovlev's team at Newcastle University won the Innovator of the Year 2012 award for their work on the Holistic project. Jatin Mistry (Southampton) and James Myers (ARM) were awarded the prestigious Technical Committee Award at the Synopsys Users Group (SNUG) conference in Silicon Valley, March 26-28 2012. We have collected long-term vibration data from a range of applications (including vehicles, machinery, and humans). These are now available for free download; more details in the resources section. Another paper has just been accepted, this time by IEEE TCAD. It is available in the publications section. Two of our papers have just been accepted by IEEE TCAS. They are available in the publications section. The Energy Harvesting simulation toolkit is now available for download from the resources section of this website. At the 2011 DATE conference in Grenoble, the Holistic project presented four papers and had a stand gaving attendees the opportunity to see videos, demonstrations, presentations and posters. 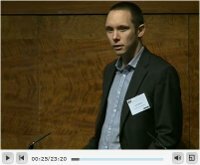 A 'research explained' article on power conversion for future energy harvesters, containing a video by Dr Bernard Stark, University of Bristol, has been uploaded. 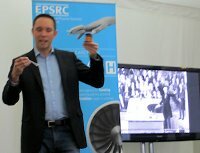 Dr Geoff Merrett and Dr Paul Mitcheson delivered a lecture and discussion session on Energy Harvesting to a packed crowd of over 100 members of the public at The Times Cheltenham Science Festival 2013. Dr Paul Mitcheson delivered a keynote presentation on "Energy Harvester Powered Sensors: A Holistic Approach" at the Energy Harvesting 2013 conference. Prof Steve Beeby will deliver a presentation on "Holistic Energy Harvesting and the Energy Harvesting Network" at the ZEROPOWER Workshop, being hosted by the EU ZEROPOWER Network. Dr Alex Weddell delivered a presentation on "A Holistic Approach to Vibration Energy Harvesting" at this workshop, which took place during the Semiconductor 2K (S2K) conference. Dr Geoff Merrett presented a keynote entitled "Holistic Design of Energy Harvesting Sensor Nodes" at this workshop, which took place during the International Conference on Networked Sensing Systems (INSS'12) conference. - Dr Geoff Merrett gave a masterclass on "(em)Powering Wireless Sensor Networks"
- Dr Paul Mitcheson gave a presentation on "Advanced Power Electronics for Energy Harvesters"
- Dr Alex Weddell gave a presentation on "Next Generation Energy-Harvesting Electronics: Holistic Approach"
- Dr Paul Mitcheson gave a presentation on "Energy Harvesting Technologies (Focus on Power Electronics)"
- Dr Tom Kazmierski gave a presentation on "Next Generation Electronics for Energy-Harvesting: A Holistic Approach"
- Dr Paul Mitcheson gave a presentation on "Power electronics interfaces for energy harvesting systems"
The event was reported by the Energy Harvesting Journal. The project was well represented at the DATE 2011 conference, with consortium members from Southampton, Newcastle and Imperial in attendance. - The consortium shared a stand with the Energy Harvesting Network, giving attendees to the exhibition the opportunity to see videos, presentations, posters and demonstrators on the project, alongside holding discussions with consortium members. - Dr Paul Mitcheson co-organised a special day on "Intelligent Energy Management - Supply and Utilisation". Dr Paul Mitcheson gave a talk on "Next Generation Energy-Harvesting Electronics: A Holistic Approach" at Energy Harvesting 2011, the Energy Harvesting Network's annual conference. - Prof. Alex Yakovlev gave a presentation on "Power Adaptive Computing"
- Dr Paul Mitcheson gave a presentation on "Next Generation Energy-Harvesting Electronics: A Holistic Approach". Dr Alex Weddell helped to deliver activities on environmental energy harvesting at "Beyond Recycling," a sustainability conference for students from five secondary schools across the New Forest. Today's low-power electronic systems are designed to handle a high variability in the power demand, for example during transmissions from miniature wireless sensors. However these systems cannot cope with a highly variable power supply. If they are powered by an ambient energy harvester in an environment where the available power is low and sporadic, the system dies once the energy storage becomes depleted or damaged, with start-up being impossible if the power is not increased to a higher steady level. This project researches how to design robust and reliable electronics for situations where there is a variable, unreliable source of energy. A number of situations, or states, have been defined, according to the level of depletion of on-board energy storage, and how variable the power supply is. In the most challenging states, for example where the input power is sporadic and spread over a wide range from nW to mW, modern electronics fails. We call this the "survival zone" and are investigating a combination of techniques from the areas of power electronics and asynchronous microelectronic design to allow devices to operate in this zone. Techniques include control circuits that are able to ride through variable voltages, the detection of states, and reconfigurable hardware resources and control algorithms to suit sporadic and sub-microwatt input power. The chief aim of this project is to produce survival zone design methods for the microelectronic design community.